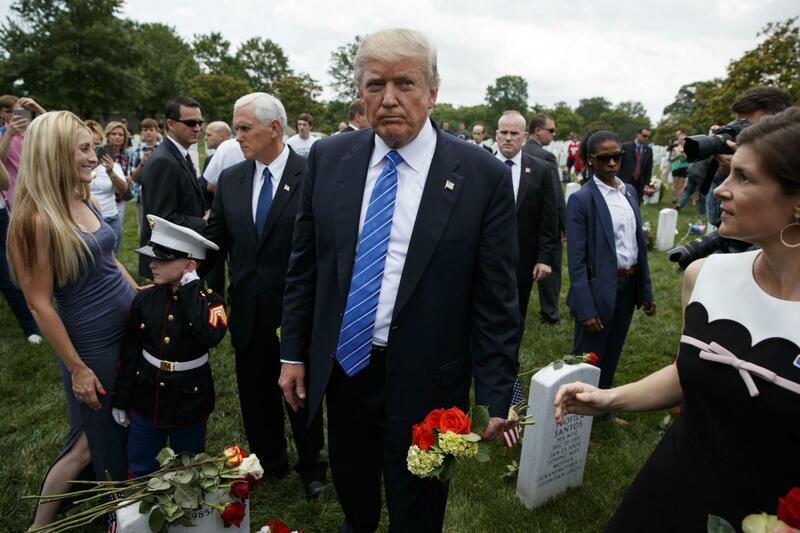 Donald Trump used America’s Memorial Day to momentarily remove himself from the controversy surrounding his administration over alleged links to Russia - visiting Arlington National Cemetery and honouring those who had died in war. It was Mr Trump’s first Memorial holiday as president, and at Arlington he laid a wreath and paid special tribute Robert Kelly, the son of his Homeland Security Secretary John Kelly. The 29-year-old was killed by a roadside bomb in Afghanistan’s Helmland Province in 2010. Mr Trump, who secured five draft deferments for Vietnam - four for college and one for a bad ankle - will have appreciated the solemnity and the warm response he received at Arlington. Since he returned from a nine-day overseas visit, his first official foreign trip, his administration has been besieged by fresh revelations over his campaign team’s contacts with Russia. The most recent furore focuses on his trusted advisor and son-in-law, Jared Kusher, who reportedly sought to establish a communications backchannel with Russia, during a meeting last December with Russia’s Ambassador to Washington, Sergey Kislyak. It was also reported that the 36-year-old was a focus of the FBI’s ongoing probe into possible collusion between Mr Trump’s team and the alleged effort by Moscow to influence the 2016 election. Mr Kushner has offered to testify with any official investigations. Mr Trump has been placed in an intensely difficult predicament by the developments. There are few people he trusts more than his son-in-law and would be loathe to lose him from the West Wing. At the same time, amid reports that the President is planning a major shake-up inside the White House, there is said to be mounting talk that Mr Kushner may be obliged to take a leave of absence until the issue is resolved. For now, Mr Trump is sticking with the man married to his eldest daughter. “Jared is doing a great job for the country. I have total confidence in him,” he said in a statement to the New York Times. Mr Trump’s Secretary of Homeland Security, who was present at Arlington, has also come to the defence of Mr Kushner. Over the weekend, he said that the suggestion to establish a back channel communication with Moscow was both “normal” and “appropriate”. Speaking at Arlington, Mr Trump said: “To the entire Kelly family, today, 300 million American hearts are joined together with you. We grieve with you. We honour you and we pledge to you that we will always remember Robert and what he did for us.